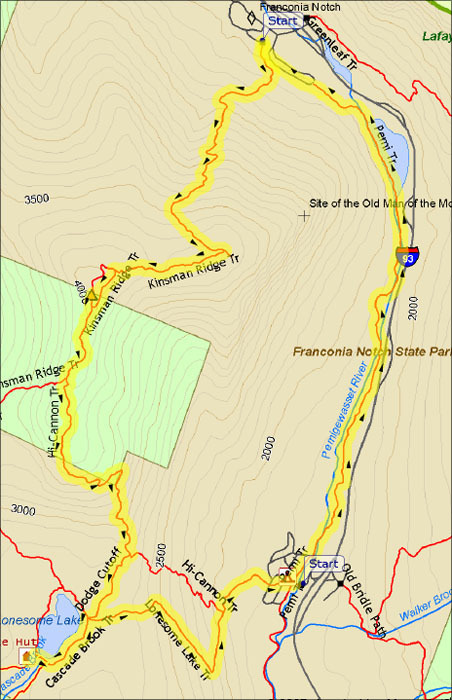 After leaving home at 4:20 AM under a clear night sky, and driving northward as the darkness gradually turned into a nice sunny day, I was not amused when, upon entering Franconia Notch, the clouds suddenly appeared, the temperature dropped, and it began to snow lightly. But I was here, and hoping that the weather forecast for clear weather would bear true, Muffin and I started up the Kinsman Ridge Trail from the Cannon Mtn ski area around 7 o'clock. The Kinsman Ridge Trail began gently enough, but soon began to climb more steeply, roughly paralleling one of the ski trails. Not too far up, there was a partially obstructed, but decent view of Echo Lake, Artist's Bluff, and Bald Mtn at the extreme northern end of the notch. The ground was bare until about 2300 ft, when the snow began to appear in its customary spring form of a narrow packed strip in the middle of the trail. A bit higher up, the route began to ascend a very steep, somewhat open and eroded slope, occasionally switchbacking up the most troublesome sections. 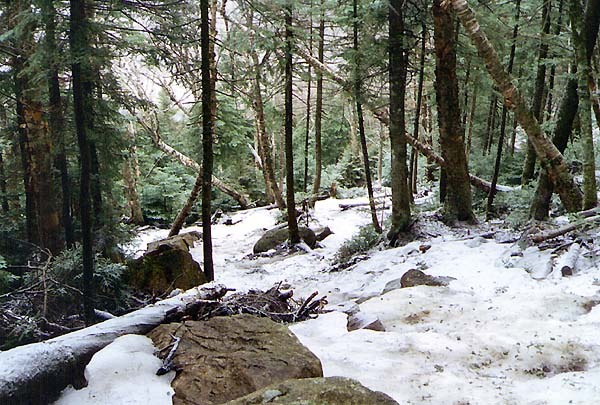 The snow depth was greater here, entirely covering the forest floor, and with a fresh dusting from the current squall. The wind had picked up, whistling through the treetops and spreading an icy fog across the side of the mountain. 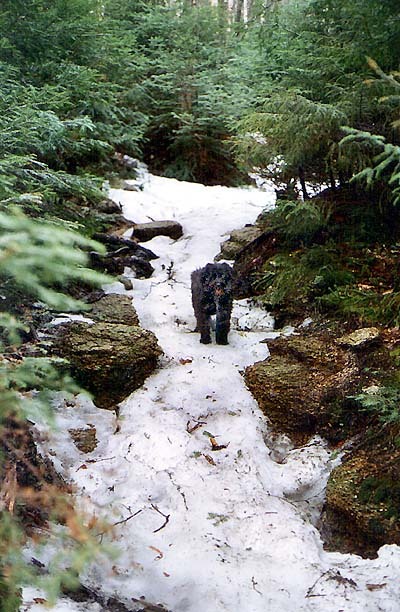 Runoff from melting snow was cascading down the slope, often gurgling audibly beneath the layers of snow and ice. The surface was hard and slick. Without crampons, I never would have made it. And even with my crampons on, one slip could have sent me careening down the mountain with not much to dig into, even if I had brought my ice axe. As usual, Muffin seemed to pick her way up the frozen ground on unseen patches of stable ground. Trailhead sign. 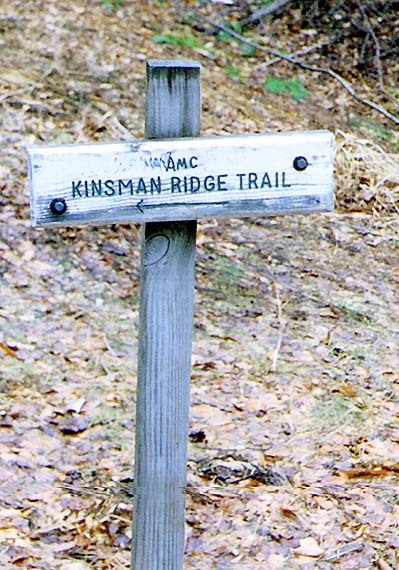 This is actually the second sign you encounter, at about 1/10 of a mile from the parking lot, but it's the first sign that specifically says Kinsman Ridge Trail. 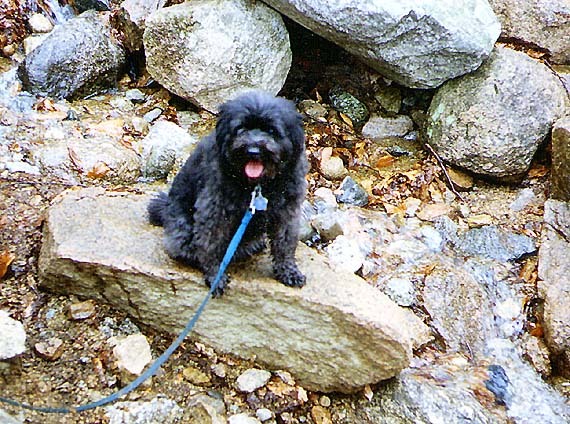 Muffin on the Kinsman Ridge Trail not far from the ski area. At this point, we were still below the snow line. Echo Lake from the Kinsman Ridge Trail. 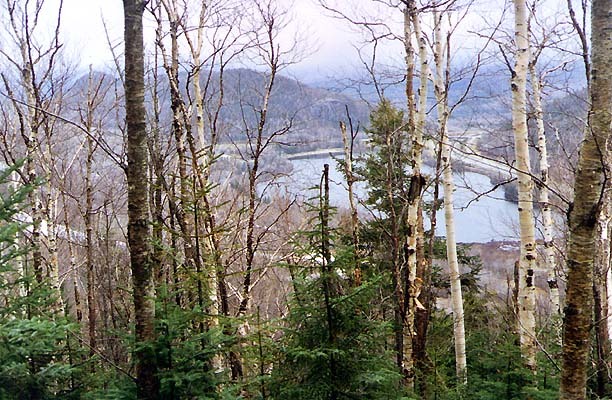 The two small hills behind and to the left of the lake are Bald Mtn and Artist's Bluff. Muffin on the Kinsman Ridge Trail just above the spot where snow began to appear. Looking down the Kinsman Ridge Trail. For about a half mile, the trail switchbacks up a steep, somewhat open, and eroded slope. This area was extremely icy and would have been dangerous without crampons.